It's Wednesday So It's Time To Book Club!! Today's picture is of the Livraria Lello & Irmão bookstore in Porto, Portugal. 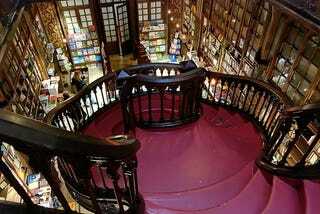 It's one of the oldest bookstore in Portugal and I want one!! Wow! So now that we have that out of the way, let's do the bookclub!! This past week, I read The Runaway King by Jennifer A. Nielsen, the sequel to The False Prince. Without getting into too much detail, it was worth the buy and I'm curious about how the triolgy ends. Right now, I'm reading The Friday Society by Adrienne Kress. This was actually reviewed by io9 so I was curious. I'm 90 pages in and I really like both the world and all three of the main characters. Your turn! What have you all been reading this past week?